Finding unique beach wedding theme favors can be fun for the bride to be. 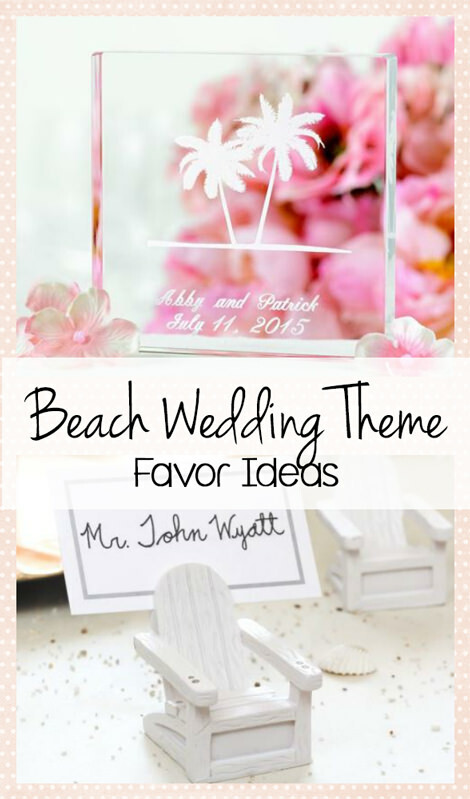 You don’t even have to go to the beach to create a memorable day with the beach wedding theme. You can create your own beach and use a variety of pre-made or homemade decorations and favors to make your guests think about the beach. From the sand between your toes to the salty water caressing your hair, this is a refreshing way to ring in the next phase of your love life. Many wedding theme favors can serve double duty, saving you some money in that tight wedding budget. While they will add to the decorative appeal of your wedding space, they will also become favors that your guests will enjoy taking home. They can also make your reception tons of fun, so whip out the beach balls and see if you can keep them in the air while you dance the night away. 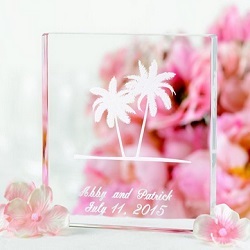 The following unique wedding favors are perfectly suited for a beach occasion. 1. 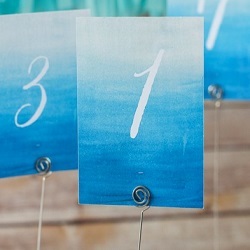 Watercolor Table Numbers - If you need to mark tables for servers to deliver meals or guests to remember their seating arrangements, these white and blue table numbers will fit right in with your beachy day. 2. 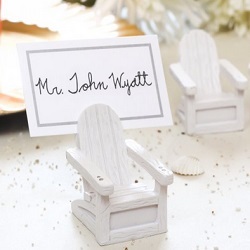 Adirondack Chair Place Card Holders - If numbers just won’t do it, you can put exact names on place cards and use these adorable lounge chair holders to secure them in place. Your guests will find their assigned spots and get cozy for your reception. 3. 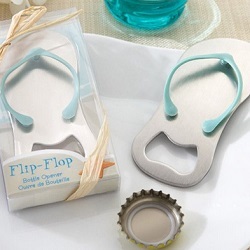 Flip Flop Bottle Openers - Bottle openers are functional gifts that your guests will want to keep on hand, so your money is never wasted on this type of wedding favor. You can’t go to the beach without your flip flops! 4. Flip Flop Luggage Tags - If you like the flip flops but aren’t big on bottle openers, here is another beach wedding favor option. These luggage tags are cute enough for your guests to take on summer vacation year after year. 5. 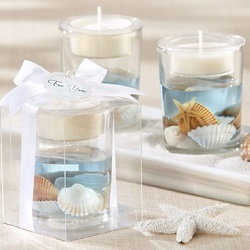 Seashell Gel Tea Light Holder - Candle holders look beautiful when worked into your place settings, and your guests can burn them in memory of your wedding while you head off for your honeymoon. This is a practical item that your guests will love using, but they are also affordable for most wedding budgets. 6. 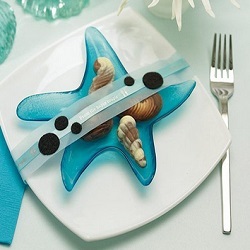 Glass Starfish Dishes - These blue glass dishes are designed to hold candy, but you can fill them with rose petals, small flowers or decorative glass pieces. 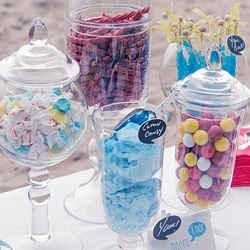 If you plan on using personalized M&Ms or chocolate bars, this is a good way to hold them on the tables until your guests dig in for the party. 7. 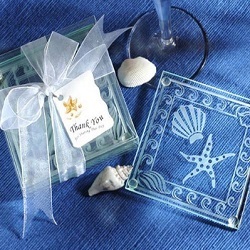 Frosted Glass Coasters – Shells and Starfish - There is no better way to tell someone to watch where they put their glass than to provide beautiful frosted glass coasters. These coasters come in their own boxes and are sealed with a bow, so they look great at your reception and serve as take-home beach wedding theme favors. 8. 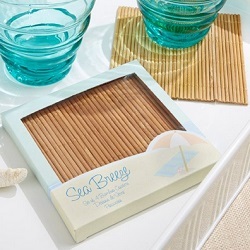 Sea Breeze Bamboo Coasters - Glass coasters are perfect if you want packaged wedding favors that you can hand out to guests, but these bamboo coasters are perfect decorative accessories for the reception. You can still allow guests to take them home or just use them in your home for parties and family gatherings. These come in a set of 4 as well. 9. Apothecary Jars with Pedestals - These decorative jars can hold personalized M&Ms, customized wrapped candy, rose petals, sea shells, small flowers or any other decorative item that fits with your wedding theme or wedding colors. Your guests will enjoy emptying the jars, and you will find many ways to use them in your home after the wedding. 10. Personalized Palm Tree Cake Topper - While you’re shopping for favors that your guests can take home, why not find a personalized take-home for you and your new spouse? This cake topper is made from acrylic and looks much like crystal. It is etched with a palm tree, and you get to decide what it says.